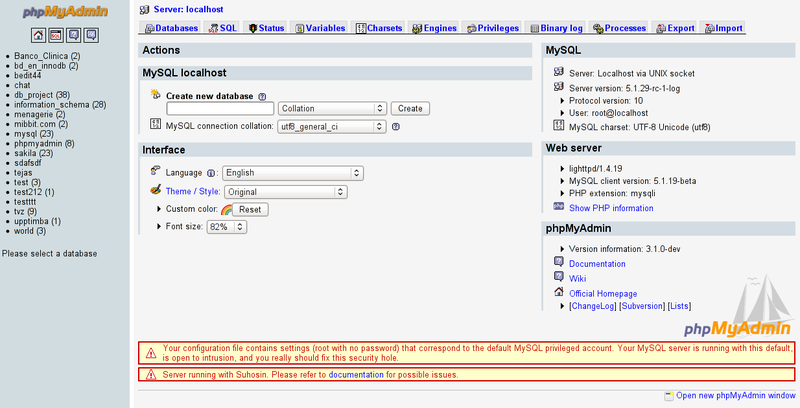 phpMyAdmin handles the basic administration of MySQL over the Web. ...... for various operations. The phpMyAdmin team will try to help you if you face any problem, you can use variety of support channels to get help. phpMyAdmin is also very deeply documented in a book written by one of developers - Mastering phpMyAdmin for Effective MySQL Management, which is available in English, Czech, German and Spanish. To ease usage to a wide range of people, phpMyAdmin is translated into 62 languages and supports both LTR and RTL languages. * Browse and drop databases, tables, views, fields and indexes. * Create, copy, drop, rename and alter databases, tables, fields and indexes. * Maintenance server, databases and tables, with proposals on server configuration. * Execute, edit and bookmark any SQL-statement, even batch-queries. * Manage MySQL users and privileges. * Manage stored procedures and triggers. * Import data from CSV and SQL. Qweas is providing links to phpMyAdmin 3.4.9 as a courtesy, and makes no representations regarding phpMyAdmin or any other applications or any information related thereto. Any questions, complaints or claims regarding this application phpMyAdmin 3.4.9 must be directed to the appropriate software vendor. You may click the publisher link of phpMyAdmin on the top of this page to get more details about the vendor.